As the mayor of a frontier town, you stand in the center, eyeing the roads for talent and trouble. Will you take on challenges or hire help, develop your town or command its heroes? Your strategies, risks, and fortune can transform your village into a thriving city or forgotten ruins. 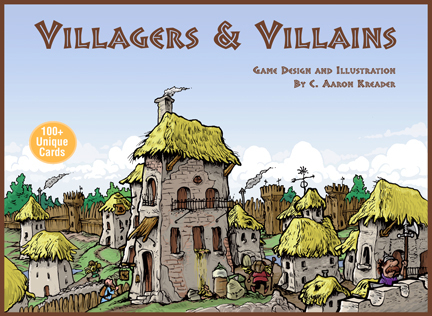 Game play: Villagers and Villains is a building game. In the 1st phase players recruit cards from a common pool neutral to all players. 4 classes of cards could appear in the pool: Challenges, citizens, buildings, and heroes. Each card has different game play applications and different affects on end scoring. In the 2nd phase each player has a chance to defend their town from challenges. In the 3rd phase challenges loot towns left unprotected. The 4th phase is when each town earns money. In the 5th phase money can be spent to expand a town by hiring heroes and citizens or creating buildings. The final phase resets the board for a new round of phases. The starting player changes and rounds continue until a town reaches a fixed size. At that time the game is scored. Goal:In the end each town is scored based on a variety of facets and features. Players have to assess which facet will score the most points as the game is played–and circumstances dictate. Features: The game ships with a basic and advanced version for experienced and novice gamers and special 2-player game rules. In the advanced game players gain access to the king’s favor, special card powers, and pairing options for final scoring. In addition, the rules and variation page offers a variety of rules variations for added game play. 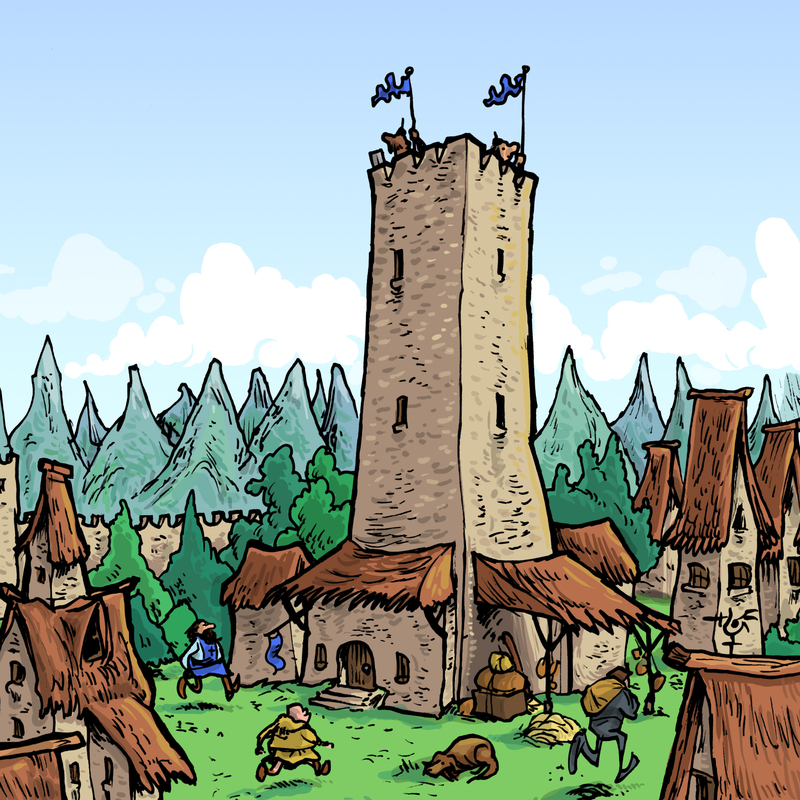 While chance plays a part in the game (via a die-roll for certain elements) choices in recruiting, and how to use town’s abilities and resources play a large role. Release info: Villagers & Villains: City Builder expansion was funded on KICKSTARTER and has arrived! If you missed getting in on the KICKSTARTER copy, you can order the standard version from our store. Release info: Villagers & Villains: The Borderlands expansion was released July 30th 2014. The expansion provides 22 unique new cards—each with a dynamic not seen in the base game! Orders are available NOW in our store. "In the untamed wild, villains lurk in wait, terrors haunt dark lairs, tradesfolk seek riches, and heroes come to prove their valor."